Fortnightly Club of Eugene is a women’s study group that originated in 1893 at the initiation of Dr. Alice Chapman, wife of the second president of the University of Oregon. Fortnightly was the first club of its type in Oregon and perhaps the first west of the Rockies. Thirty-two women convened in a small room over a grocery to hear Dr. Chapman’s proposal. In 1894, 22 founding members, representing both the University of Oregon and the town, elected officers to Fortnightly Club and adopted a constitution and bylaws. The stated purpose of the Club was to “bring together women interested in artistic, economic, philanthropic, literary, and scientific pursuits with a view of rendering them helpful to each other, and useful to society.” In the early 2000s, the Club shortened the purpose statement to read, “to bring together women interested in cultural pursuits and fellowship.” Each year, nine women present papers on the year’s theme, recently ranging from “Film” to “Food” and “Human Migration” to “Humor.” Three meetings a year are dedicated to local experts who address the theme. In addition to intellectual pursuits, Fortnightly members have historically participated in community service, particularly in support of libraries. In 1895, members contributed funds, magazines, and books to start a subscription library. They took turns managing the library in a space provided by a Eugene businessman. An annual fee of $1 entitled subscribers to borrow one book or magazine each week. 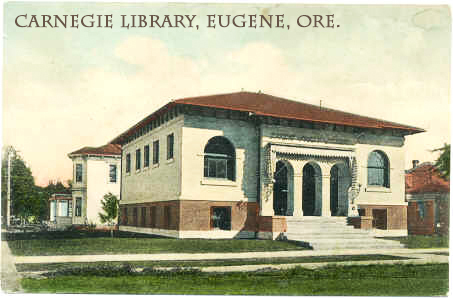 In 1902, the Club launched an appeal for a tax levy that established Eugene’s first free public library. The Club secured a grant for the first Carnegie library in Oregon, opened in 1906. In 1945, Fortnightly raised funds to improve library facilities and community access to books. Members played a key role in the campaign to build Eugene’s new public library, opened in 2002. In 2015, members promoted public support for a tax levy that restored library hours and outreach. Fortnightly was active in the Oregon Federation of Women’s Clubs from 1904 to 1963 and continues to support community causes. Fortnightly maintains a website for members, plans social gatherings in addition to regular meetings, and collects oral histories of members. Fortnightly records may be viewed in the Special Collections and University Archives at the University of Oregon Library.